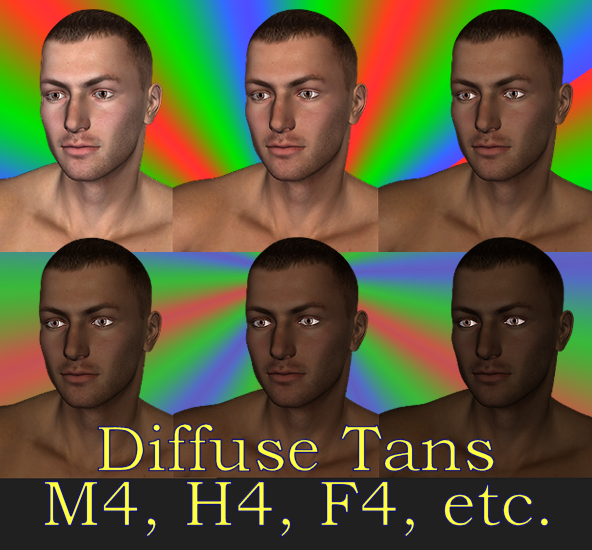 A set of 7 diffuse tan .pz2's for your DAZ "generation 4" gents. These are designed to be applied *after* you apply your favorite skin texture. Examples are shown using the tans over M4's default texture. No textures or geometries included. thelufias (6 months ago) Inappropriate? Eponica (3 years ago) Inappropriate? likeblue (7 years ago) Inappropriate? EbruKash (8 years ago) Inappropriate? Daninsky (8 years ago) Inappropriate? "Eden Evergreen" (9 years ago) Inappropriate? SDKrew (9 years ago) Inappropriate? NubaX (9 years ago) Inappropriate? I already used it for V4 and its Great. It actually Tans the Skin tone of any current Texture Map that I have.